Northern Ballet is bringing history’s most notorious lover to life with a sensual new ballet, Casanova. The internationally acclaimed company will transport audiences to 18th century Venice, telling the story of the infamous Italian adventurer in a seductive masquerade of passion and politics. Northern Ballet will perform the show at Milton Keynes Theatre from Wednesday, April 19, through to Saturday, April 22, as part of its World Premiere Tour. Fiercely intellectual Giacomo Casanova leads a controversial life consumed by his desires. He dabbles in careers as a scam artist, violinist, alchemist and church cleric but with a penchant for gambling and women, his exploits lead him into a whirlwind of scandal and excess resulting in imprisonment and exile. A true story so sensational, some cannot believe it is real. Casanova is choreographed by award winning Kenneth Tindall who has co-created the scenario with actor, dramatist and historical biographer Ian Kelly, author of the Sunday Times Biography of the Year Casanova. The ballet is set to an original score by modern classical, film and television composer Kerry Muzzey, which is played live by Northern Ballet Sinfonia. 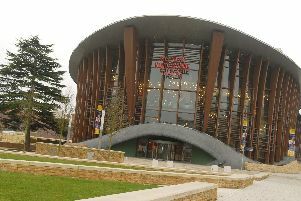 Tickets cost from £13 and are available online from www.atgtickets.com/miltonkeynes or call the box office on 0844 871 7652. At the same time, Northern Ballet’s Short Ballets for Small People will also be at the theatre with Goldilocks and the Three Bears. This is the perfect opportunity for little ones to enjoy live ballet, music and theatre for the first time. With a running time of approximately 40 minutes, Goldilocks will be performed at noon and 2pm on Friday, April 21. Tickets cost from £8, details for booking as before.